When you think of earthquakes, you don’t think of England. When it comes to weather, I don’t really think anything about England save rain and fog. Still, apparently England is more exciting than I thought, as northern England was rattled by a small earthquake overnight, according to the British Geological Society (or BGS). 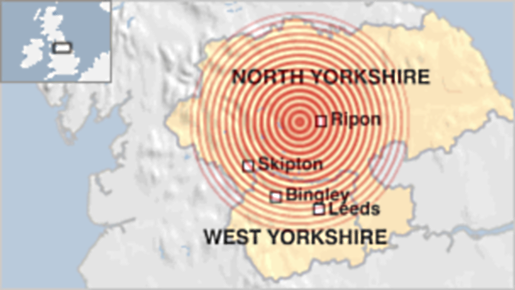 A 3.6 magnitude earthquake rattled North Yorkshire, England, centered about 5.6 miles or 9 kilometers from the city of Ripon. I live in an earthquake zone. The New Madrid fault runs through my state, albeit pretty far from where I live. That said, if that thing ever goes up, I’m going to know it. When a smaller earthquake hit Illinois, I was able to feel it in northern Kentucky. It’s not as if we’re Maui on the Pacific Rim, but still, it’s not as weird as an earthquake in New York or England.